Triggerfish are distinguished by their strong jaw and mischievous behavior. Their strong jaws are used for crushing rock, shells, or corals so exercise caution in reef aquariums. 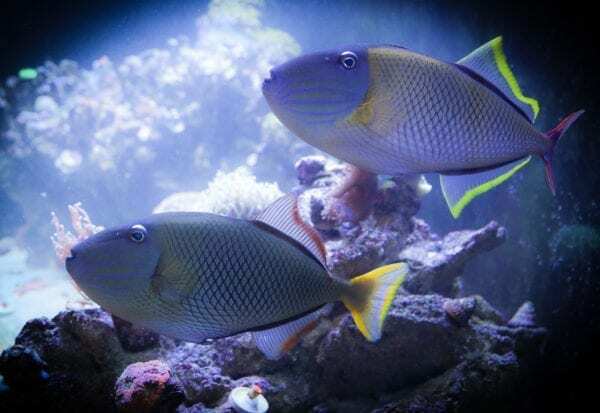 Triggerfish generally make good aquarium inhabitants because they’re hardy, disease-resistant, and easy to feed (when acclimated). The Crosshatch Triggerfish, also known as the Blue Cheekline Triggerfish, can be found throughout the tropical and sub-tropical Eastern and Western Pacific Ocean. The Crosshatch Trigger is aptly named after the interesting crosshatch patterning on its body. The yellow body coloration, more prominent in males, is adorned with dark crosshatch lines. The face has very distinct blue lines streaking from the mouth to the back of the gill plate. The males have beautiful blue fins lined with yellow trim and a red tail. The females, however, have more greyish fins trimmed with red and a yellow tail. 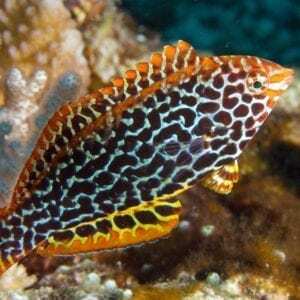 The Crosshatch Triggerfish would be a beautiful addition to any large saltwater aquarium. Crosshatch Triggers can be kept singly, in bonded pairs, or in groups of one male and two or more females in the aquarium. Two males should not be housed together unless there are many inhabitants in a very large aquarium. A male and a female Crosshatch Trigger bonded pair tend to do very well together. 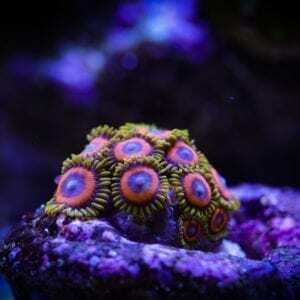 These triggers are extremely active and require a lot of space to roam, minimum of 200 gallons, especially if you have an aquarium with several other inhabitants. They require areas of open swimming space as well as places to hide at night or when frightened. Unlike most Triggerfish, the Crosshatch has a mild disposition and is not likely to bother other aquarium inhabitants unless overcrowded. The triggers will mix well with most reef fish, just not bite sized fish. 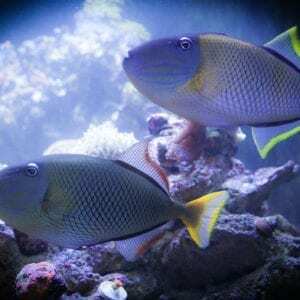 The Crosshatch Triggerfish are not finicky eaters and will consume most meaty aquarium fare. Although, while acclimating, it took about five days for my male to eat and eight for the female. Their diet should consist of predominantly meaty foods, such as chopped squid, krill, clams, small fish, and hard-shelled shrimp. This will help wear down their ever-growing teeth. Crosshatch triggers should be fed 2-3 times a day in order to maintain proper body weight. The Crosshatch Triggerfish species should be kept in an environment with a temperature between 72 and 78°F. A pH value of 8.1-8.4, a salinity of between 1.020-1.025, nitrates and ammonia levels at 0 ppm, and dKH 8-12 should be maintained.